A subject I’ve long meant to cover on the Bioscope is fashion in silent film. It’s a subject of great importance, because of the strong relationship between what was worn on the screen and what the audience in the cinema then dreamt of wearing. That relationship was exploited commercially, by fashion firms whose products featured in films and by those stars who were used to promote fashions (on and off-screen). Moreover, there is an equally important, if less recognised connection between fashion and film, which is the record that film can provide of what ordinary people in the street were wearing. Fashion is found not just on the catwalk or the movie screen, but on the pavement as well. However, I am no expert in fashion (as anyone who has seen how I dress would be quick to affirm). But I can produce a guide to some sources, particularly online video sources, to help those who might like to explore this area further for themselves. Let’s start with films of the fashion houses. 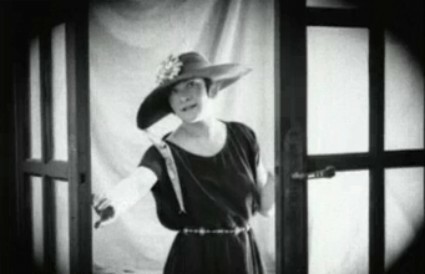 Short films showcasing the latest fashions from the Paris houses were a staple of film programmes of the 1910s and 20s. Films showing mannequins parading gowns, hats and shoes beyond the hopes of most in the cinema audience were seen in individual films and occasional special film series, but more commonly as part of newsreels and cinemagazines. Beyond the hopes of most they may have been, but not all. There was commercial sense in it because coturier fashions were starting to move from appealing to the exclusively rich and were starting to appear in department stores, just at the time when cinema was doing it best to attract a more middle class and monied audience. Fashion films were part of the general aspirational trend of the cinema, and they were there in particular to attract women to the cinema. French film companies became the natural specialists in the field, not least because Pathé and Gamuont had factories dedicated to producing artificially coloured films employing a stencilling process (and many women workers painting the individual frames using those stencils). Fashion films in which the models moved slowly displaying gorgeously coloured gowns were ideal subjects for a colour process that struggled to capture objects moving at speed. Colour was naturally attractive for the fashion film, and fashions were a fine means of showing off colour processes. One of the earliest of all magazine film series was Kinemacolor Fashion Gazette (1913), edited by British fashion journalist Abby Meehan, which showcased the pioneering natual colour process and combined its exhibition with a live fashion revue organised by the Evening News newspaper at the West End Cinema in London. 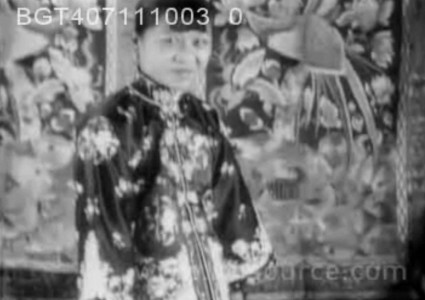 Colour fashion films from the silent era are hard to find online, but there are monochrome examples a-plenty. The British branch of Pathé featured many fashion items, particularly in its women’s magazine series Eve’s Film Review, and numerous examples (including Fashions à la Parisienne, illustrated below) can be found at www.britishpathe.com (type in ‘fashions’, ‘maison’ or ‘paris fashions’ for the best results. Gaumont’s early 1920s Around the Town cinemagazine had many fashion-related items, though only a few examples of the series exist today, and none online (many of the lost films can nevertheless be found described on News on Screen). 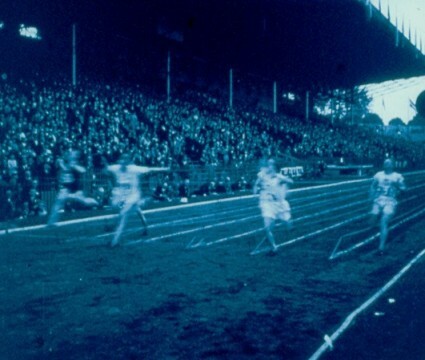 Examples from French Gaumont and Pathé can be found on www.gaumontpathearchives.com, though that requires registration and it’s not easy to obtain permission unless you are a production company. But as said, there was more to fashion than Paris. One of the overlooked virtues of archive films is what they are able to show us of what we wore. There is nothing quite like film for showing what was worn by people day-to-day, how those clothes fitted in motion, and how popular fashions changed. Again the newsreels provide an excellent source, but a still more useful one has just emerged from Brighton. It was Brighton professor Lou Taylor whose 1980s television series Through the Looking Glass first alerted me to the value of using archive actuality film to study what ordinary people were wearing, and it is the University of Brighton’s Screen Archive South East which is the source of Screen Search Fashion, a thematic guide to fashion and dress in films of the 1920s and 30s held in the Archive’s collection. 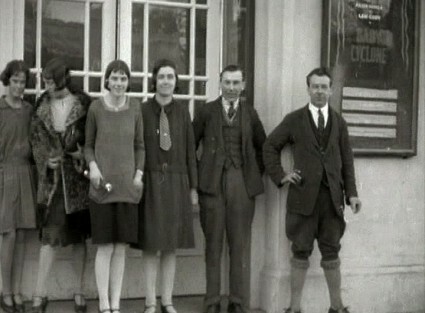 A group of young people stand outside a cinema in Burgess Hill. The men wear three-piece suits. One man wears the fashionable ‘plus fours’ style popularised by the Prince of Wales rather than full-length trousers. The women follow the fashionable androgynous silhouette of the period with knee-length hemlines. They wear interchangeable separates including sweaters, skirts, dresses and coats. One woman sports a necktie reinforcing the boyish look. Their clothing is probably ready-to-wear rather than made by a dressmaker. All the women have bobbed hair and none wear hats. This is just what film archives should be doing – making us look at films anew. Amateur films, home movies, newsreels and magazine films are filled with sociological detail, but it needs someone with an intelligent understanding of the films’ milieu and contents to open our eyes to hat these films contain. This Screen Search Fashion does so well, illuminating men’s and women’s clothing, and for both adults and children. It is such a sensible and well-executed idea to have had, and I warmly recommend it. Turning to the feature film, there was a close connection between the couture houses and some film producers from the mid-1910s onwards. 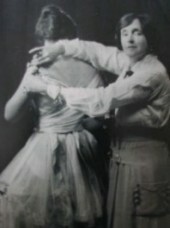 The already-mentioned Lucile, or Lady Duff-Gordon (shown left, from www.ladyduffgordon.com), was the great pioneer, dressing a number of films from the mid-teens onwards (Lillian Gish tell us that Lucile supplied the models for the ball scene in Way Down East) as well as ensuring that her fashions appeared regularly in magazine films. Couture houses have always supplied dresses for feature films, particularly from New York, as quite a lot of filming was done in the East Coast studios. The couture houses did not, as a general rule, get any kind of screen credit, although news items often appeared in trade and fan magazines telling film-goers that a star would be getting her dresses from a particular fashion house. Many actresses who were rather short on acting talent relied on the lavishness of the wardrobes, because the ability to wear clothes well was just about all they had to offer. Roberta Hickman (who was working around 1915) wore clothes from Lucille [sic] and Poiret, Irene Castle used Lucille Ltd. Alice Joyce and Corinne Griffith were faithful to Madame Frances. Many actresses used Hattie Carnegie, but she was smart enough to get a screen credit for the films she did with Constance Bennett. Then were were people from the couture houses who went to work in films – but that takes us into the world of the costume designer as a profession in the silent era, and that will have to be the subject of another post, at another time. For some further reading (aside from Elizabeth Leese), Jenny Hammerton’s For Ladies Only? Eve’s Film Review: Pathe Cinemagazine 1921-33 is very informative on the fashion films in this key series, while Emily Crosby’s essay ‘The Colour Supplement of the Cinema: The British Cinemagazine, 1918-1938’, in Projecting Britain: The Guide to British Cinemagazines illuminatingly links the cinemagazines’ use of fashion to the place of fashion in 1920s culture as a whole. The book also contains some interesting examples of letters written by Pathé’s editor to some fashion houses. Hours of fashion fun! Thank you, Bioscope! Well thank you, but not one of my better efforts, I’m afraid. I got half way through and realised it was going to take a great deal more research to do it properly, and there just isn’t the time at the moment. Ummed and erred whether to abandon it entirely, then thought that some might find some use in it. So there it is. This is a great resource. While searching for information about vintage foundation garments I came across the camp-berlei clip and in a roundabout way found your other fashion recommendations. Bravo.